We’d love your help. Let us know what’s wrong with this preview of Boston's Gun Bible - Revised with 2008 D.C. v. Heller by Boston T. Party. A wonderful reference book for anyone who owns a gun or wishes to purchase one. 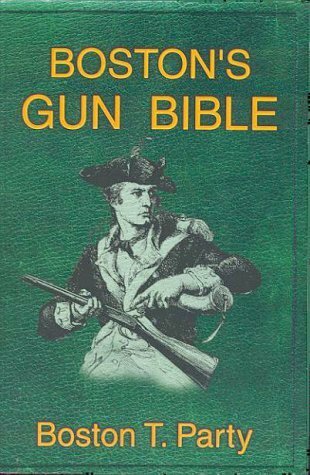 To ask other readers questions about Boston's Gun Bible - Revised with 2008 D.C. v. Heller, please sign up. I might as well write a review now, since I will never be "done" with this book. Anyone with any interest whatsoever in guns/self defense should pick this up posthaste. A good 1/4 of these 800+ pages is dedicated to discussing and comparing military battle rifles. I can't comment on this information, since I am not experienced with these weapons (yet). Handguns get about 50 pages, and shotguns get less than two pages. There is so much food for thought here that I don't know where to begin. Here is I might as well write a review now, since I will never be "done" with this book. Anyone with any interest whatsoever in guns/self defense should pick this up posthaste. Terminology, safety and handling, self defense and the law, tactics and training, women and guns (dudes need not skip this section; there is a lot of good info here), how (and why) to become a rifleman, how to buy, sell and trade, gun laws in the 50 states and D.C. (some of this info is outdated, though). The real goal of "gun control", Letter to a Columbine Student (this alone is worth the price of the book), creeping citizen disarmament, increase in crime rates after citizen disarmament, registration, confiscation. As I said, I will never be finished with this book. This is not a "cover-to-cover and done" deal, it is a reference text that can (and should) be reread and contemplated often. There are no page numbers. The numbering is done by chapter and page, so the fourth page of the tenth chapter is page 10/4. Weird and pointless. Boston might want to employ a copy editor. There are quite a few boo-boos. Most are simple spelling/grammar gaffes, however the worst one I found was under Rule #2 of safe gun handling: "Do wave your muzzle past people." NO! Do NOT wave your muzzle past people! Anyone with half a brain will figure out what he meant, however I think it is important to be precise, especially when discussing a topic as serious as gun safety. None of these flaws prevents this from being essential reading. If my copy of Boston's Gun Bible was lost or stolen, I would pay triple the price to get another one if necessary. AWESOME! If you want to learn a lot about guns, this is the book for you. It has a few gun-nut anti-government chapters which can be disregarded, but the amount of information is amazing. Focuses on assault weapons and gives a thorough review of most of them. Also provides excellent advice on which guns one should own. The author's writing style is VERY easy to read. The book actually went very quickly, despite its length. Its a pretty good resource on firearms. The most comprehensive gun book I’ve read since Hatcher’s Notebook. A great reference. This book is a wealth of knowledge! Seriously, tons of great information. A little too much in some cases. The book is monstrous! I recommend reading this book with a highlighter and pad of sticky notes. You will definitely be coming back for information you will want to research later. The author offers up a plethora of recommendations and thankfully also includes his reasoning in most cases. The book is a bit dated and some of the advice and reasoning may not hold as much strength as it did at This book is a wealth of knowledge! Seriously, tons of great information. A little too much in some cases. The book is monstrous! I recommend reading this book with a highlighter and pad of sticky notes. You will definitely be coming back for information you will want to research later. The author offers up a plethora of recommendations and thankfully also includes his reasoning in most cases. The book is a bit dated and some of the advice and reasoning may not hold as much strength as it did at the time or writing. The author also offers up many seemingly unrelated opinions having to do with politics, etc. The book could have been much shorter and still offered up the amazing practical advice. in 1942, when the threat of invasion from nazi and japanese forces seemed very real, charles haven and melvin johnson, jr. wrote the delightful little book, a comprehensive small arms manual. in that volume, the authors detailed a wide variety of weapons suitable for the defense-minded citizen of the period. they tested and evaluated these weapons and commented on their usefulness in opposing the designs of foreign socialists and imperialists. boston t. party, in [this book] has done the same thing for patriots in the first decade of the 21st century. A fine resource on learning about firearms, with a heavy leaning on obtaining a modern battle rifle. Around 30% of the book is 2nd amendment America rah rah RAH talk, but the rest is extremely useful information about gun ownership, chosing a survival arsenal, basic riflemen skills, and other useful topics. Overall a good book for anyone interested in firearms. Good book if you've got some basic firearms knowledge. I say that because there is a good bit of bad info in this book that a complete novice would not pick up on. Also the authors heavy handed bias for "Battle rifles" gets a little annoying at times, as if every thing else is some how totally inferior because it doesn't shoot 7.62mm. This was my primary guide to finally upgrading from a .223/5.56 calibre weapon to a MBR in .308. Finally picked a FN-FAL derivative over the M1A. This book also inspired my switch to .40 S&W from the smaller hotter 9mm parabellum for my primary pistol. A very handy & resourceful compendium to keep close at hand. As you can afford to do so you should buy copies to share! Covers a lot of stuff that as a woman who has no interest in big calibers (but more interested in being a good shooter), it's invaluable for your firearms of choice. Plus he's just a great guy to boot! Thanks for going to all the trouble, Boston! Good book, don't agree with all of Mr. Royce's opinions on specific firearms but if you're planning on buying some battle rifles for your collection, you should read this first. Now somewhat dated. Still full of useful information. Huge amount of information on guns, but read mainly for the crazy commentary by the author. American author known for his libertarian stances on privacy and arms. He is also one people behind the Free State Wyoming project whose goal is to bring people of "demonstrably ethical character" to the state of Wyoming in the western United States to encourage "political liberty, free trade and voluntary cooperation."